It was a chance to see a variety of businesses and organizations offering a range of goods and services all under one roof. 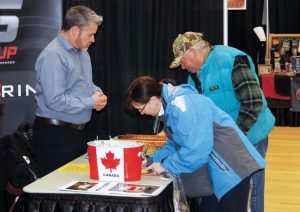 The Claresholm and District Chamber of Commerce hosted their annual Trade Expo and Consumer Fair at the Claresholm Community Centre on Feb. 1 and 2, drawing more than 200 visitors each day. “I think it was very successful,” said Tony Walker, who chaired the organizing committee. “The passport to prizes was very successful,” Walker said. The passport was issued to the first 200 visitors each day. They then took it around to participating vendors who stamped the passport. Completed passports, containing all 25 stamps, were entered into a draw for cash prizes. The winners were: first, Verne Lunan, $175; second, Gord Hewitt, $100; third, Joan Mackin, $50. Walker said the vendors who did not participate in the passport program will the next time. “They realized how important it is for people to stop at their booth,” he said. Donations of cash and non-perishable food items were also accepted at the door. By the end of the two days, the chamber had collected about $100 cash, and more than $100 worth of non-perishable food items. Overall, the Trade Expo and Consumer Fair seemed to be well received. “Everybody was saying how well organized (it was),” Walker said. “They really appreciated the layout (as well).” He noted the organizing committee made all the difference. The committee consisted of Keith Armstrong; Todd Buhmiller; Lorraine Norgard; David Richardson; Amanda Zimmer; and Brad Schlossberger, in addition to Walker. “We couldn’t have done it without them,” he said. He also commended the Claresholm Youth of Tomorrow group who helped set up the Trade Expo and Consumer Fair on Thursday night, and helped take everything down on Saturday afternoon.